I'm sorry I did not post yesterday. It was a busy day...house cleaning (glad that's done for now), the Alabama/LSU game, and a party! Whew, BUSY! Today, LOML* and I went shopping. That seemed to tire him out. SO, while he napped, I crafted. I really like this end product. I wanted to use some larger wood beads, but these were the only one I had. I'll make bigger ones later. 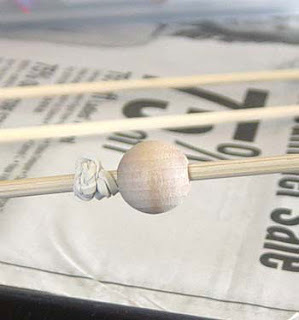 Wrap skewer with rubber band and slide bead onto skewer. The skewer will help you hold the bead without actually touching it and the rubber band will keep the bead from sliding off the end. 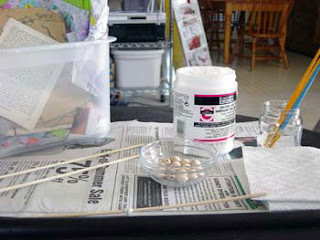 Using gel medium and decorative papers/magazine clippings, cover wooden bead. 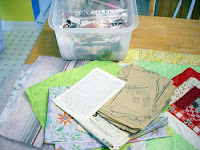 I recommend putting down a layer of thin paper (tissue) first to cover the wood then decorating with the other papers. Keep the size of the bead in mind, it’s hard to find actual pictures to put on smaller beads like these. 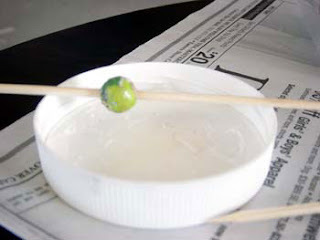 Slide finished bead onto a different skewer and lay over a bowl (I used my gel medium lid) to dry. 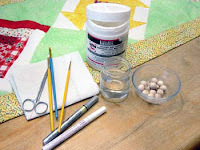 Decorate bead with paint pens. I just made black polka dots with silver dots in the middle. 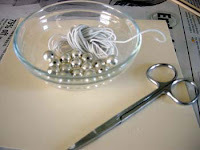 Sprinkle a little silver glitter on a piece of cardstock (I used an office folder). Lightly coat bead with more gel medium and roll it in the glitter. Let dry. In a well ventilated area (outside), spray gloss sealer/varnish. Let dry and repeat as needed. 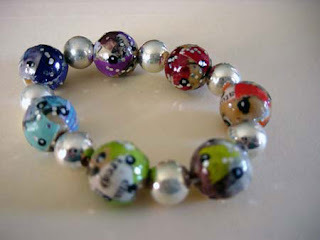 String decoupaged beads and silver beads onto elastic cord. Tie cord in a square knot. Enjoy! !